Breakstone, White & Gluck, P.C., of Boston has extensive experience handling cases for individuals who have suffered personal injury as a result of slips and falls on snow or ice. In 2010, the law regarding accidents on snow and ice changed dramatically in Massachusetts, increasing responsibility for those who cause accidents. Property owners are now responsible for removing both natural and unnatural accumulations of ice and snow, and keeping their property reasonably safe during the winter. You have a right to expect you can travel with reasonable safety outside in the winter, whether on a sidewalk in your neighborhood or in the grocery store parking lot. If you have been injured as a result of falling on snow or ice, you may be entitled to recover for your personal injuries. At Breakstone, White & Gluck, we understand the complexities of snow and ice cases, and we have the experience, expertise and resources to help our clients after they have suffered personal injuries from accidents on ice or snow. The property owner, or the person controlling the property, must use reasonable care to prevent dangerous walking conditions due to snow and ice. If reasonable care is not taken, the property owner may be liable for injuries sustained in both natural and unnatural snow accumulations. The property owner may also be liable if a third party moved the snow and the property owner should have been aware of it. The property owner may be a homeowner, a private company or a municipality. A property manager who is responsible for maintaining the property may also be liable. The company providing snow and ice removal and treatment may also be liable if their work is done poorly. The first thing you should do is seek appropriate medical treatment. Injuries on snow and ice can be severe, including fractures, spinal cord and traumatic brain injuries. Sometimes, the seriousness of these injuries are not immediately apparent. For that reason, it is important to see a doctor or visit an emergency department as soon as practicable to get checked out. If you are able, you should also take photographs of the place where you fell as soon after the fall as possible. A photograph on a cell phone camera is better than nothing. If you cannot take a photograph right away, have a friend or family member return to the site as soon as possible to do so. Photographic evidence is often the key to proving your case. Finally, you should promptly contact a personal injury lawyer experienced in snow and ice accident cases. Under Massachusetts law, the property owner must be notified of the accident within 30 days. If timely notice is not sent, your right to bring a claim my be affected. The law in Massachusetts regarding removal of snow and ice changed in July 2010. Prior to that, property owners were only liable for injuries sustained on what was known as an “unnatural accumulation” of snow or ice. Examples included gutters leaking onto sidewalks, and snow piled across walkways. The Massachusetts Supreme Judicial Court changed the common law, so Massachusetts has the same rules for snow as most other states. Now, property owners are liable for injuries that are due to their failure to maintain their premises in a reasonably safe condition. This means property owners have a duty to clear snow when it falls and keep their property reasonably safe. The question of what is reasonably safe is a fact question that may ultimately be decided by a jury. Therefore, land owners should exercise reasonable care in the removal of snow and ice as it falls and after it falls. Property owners should also check the property regularly to be sure ice is not accumulating as a result of thawing and freezing. In addition, many communities have ordinances requiring snow be removed from sidewalks after every snowstorm. 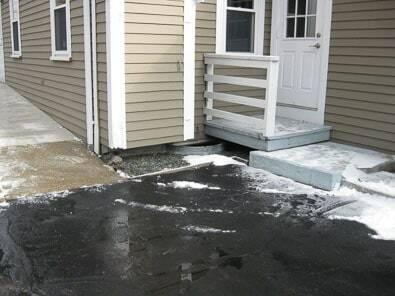 Your legal rights need to be protected after a fall in snow and ice. You should hire an experienced premises liability lawyer who understands the requirements of Massachusetts law and how to prove responsibility for your injuries. Breakstone, White & Gluck has over 80 years combined experience representing victims in accident cases in Massachusetts. Our Case Reports page describes some of the results we have obtained for our clients. 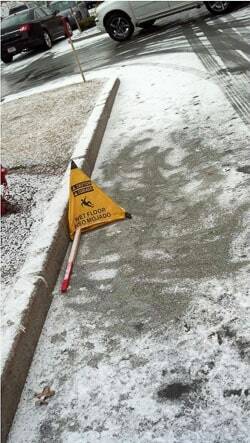 If you were injured in a slip on snow and ice, contact us today for a free legal consultation. We can be reached at 617-723-7676, or toll free at 1-800-379-1244, or use our contact form.